Lisa Goldman and Rocs to Riches won the 1.40m Open Jumpers during the Showplace Productions Spring Spectacular II. Wayne, IL - June 10, 2015 - Lisa Goldman has competed at competitions across the nation, but the local rider from Hawthorn Woods, Illinois, calls the Lamplight Equestrian Center "home." After coming off of several strong performances during the opening week of the Showplace Productions' Spring Spectacular series, Goldman returned to the Grand Prix Ring to duplicate her success and vault to the top of the leader board during the $2,500 1.30m Open Jumpers and the $2,500 1.40m Open Jumpers, taking a first day lead in the Open Jumper division. Slated as a sold-out show, the Open Jumper Divisions saw top tier competition as riders navigated Hector Loyola's courses, with nearly 150 trips in the Grand Prix Ring. The LUXMAX, U.S.A. LED screen counted the seconds, and it was Goldman who held the top of the ranks in both divisions in her usual speedy fashion. The 1.40m Open Jumpers saw intense competition in a 10-horse jump-off, with each rider attempting to best the next. Goldman took the win aboard Rocs to Riches in a dazing 31.991 seconds, and returned to the ring with Aslan as one of the last in the class to take the second place in 34.529 seconds. "With her, I haven't had too many 'let's gallop and go' moments," Goldman explained of the feisty chestnut mare. "She gets so much more confident when you can just gallop right up to the jumps, and I kept seeing the leave-out, so I kept taking it. " Rocs to Riches is a Roc USA baby, and one of the winningest among them. The mare was the winner of the YJC Midwestern League Finals, and was third in the 7-year-old Finals the year after. Rocs to Riches is a full sibling to AliBoo Farm's two-time USEF Horse of the Year, Role Model, and to Classic Roc, winner of the 2013 International Jumper Futurity Midwestern Regional. Goldman aims to compete with her in the $20,000 Welcome Stake sponsored by Nutrena on Thursday. "Hopefully, she is my next up and comer," Goldman said. Goldman's success does not come without determination and hard work. She took the second place finish on Aslan, the large gray brother of Zacontas or better known as 'Rotunda', the horse that made headlines with George Morris during the 2013 Gladstone Program. Only a few weeks ago, Goldman returned to the USET Foundation Headquarters at Hamilton Farms to ride Aslan during the clinic, and Morris called Aslan a "dream." The horse has continued to rise in the ranks and Goldman sees a bright future for the gelding. After rectifying a bridle issue during the first week of the Spring Spectacular, Goldman is ready to ride in the Welcome Stake with Aslan as one of her five mounts of the class. Tracy Fenney showed to the third place in the 1.40m Open Jumpers, finishing behind Goldman and Aslan in 34.883 seconds with MTM Reve du Paradis. Freddie Vazquez and Bachelor 4 earned the fourth place for their double clear effort in 35.100 seconds. Coming in fifth place was Replique with Katie Leverick in the irons, stopping the clock in 35.888 seconds without fault. The sixth place award went to Trapp O'Neal and Quilona Z.
Goldman continued her winning ways in the $2,500 1.30m Open Jumpers where she piloted Memphis Belle, owned by Louisa Brackett, to the winning round in 32.637 seconds, overcoming a start list of 26 competitors. The jump-off came down to 13 horse and rider combinations, yet Goldman finished at the top as one of the first riders to tackle the track. "I was just competing on her as a warm-up for Louisa," Goldman said. "She wasn't here last week, so I thought I would get her ready for her, and Belle was great. I love that horse." Goldman continued, "She always wants to go, no matter what. She is a speedster. She is really fast off the ground. She was champion in the Medium Junior Jumpers one week in Wellington, and Memphis Belle took her to all of the Junior Jumper finals in Harrisburg and Washington where they ribboned. She has just been a great horse for her to learn how to jump the bigger jumps on, and be very competitive. She won one of the classics here last year, which was a great moment for Louisa and her family." Ryan Sassmannshausen and Basho completed the short track just behind Goldman to take the second place position in 32.964 seconds. Liz Atkins and Undine would eventually capture the third place for their time of 34.220 seconds, while Martien Van Der Hoeve pocketed the fourth place with CR Guardian. The fifth place went to Trapp O'Neal and TKO Kingsride, while Kim Barone and Rival rounded out the top six. "The plan is to have five horses in the $20,000 Open Welcome Stake tomorrow afternoon," Goldman concluded. "I love Showplace Management. I really like Hector's courses. The beginning isn't huge, but he builds the course up as you go. It is technical enough, but inviting and challenging courses." The jumper action will continue in the Grand Prix Ring tomorrow when the $20,000 Open Welcome Stake, sponsored by Nutrena, will take center stage. Riders will also have the opportunity to show in the Young Jumper Championship classes, with the unique chance to compete without entry fees. Wayne, IL- June 10, 2015- The first day of hunter competition at the Showplace Spring Spectacular II kicked off with sweeping victories for Tracy Fenney and her MTM Farm mounts, earning two firsts, two seconds, and the Pre-Green Hunter Challenge win. With such a successful day under her belt, Fenney enters into Thursday's championship day leading the ranks for the Pre-Green Hunter divisions. In the irons aboard MTM Selfie, a bay gelding owned by MTM Farms, out of the Texas-base that Fenney co-operates with Michael McCormick, she navigated the pair to a first and second place finish in the first two classes of the Pre-Green Hunter division at the 3' height. MTM Selfie, a 6-year-old gelding imported near the end of last year, proved that he was worth the expense at only his fourth show since entering the States. 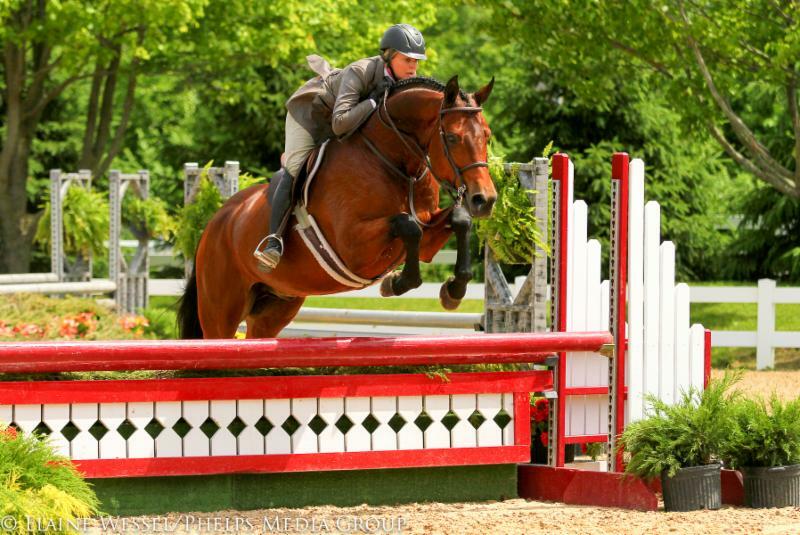 "He's a really good horse, but he typically needs the warm-up class to figure out how to get around the course. After he has a course, under his belt, the second and third ones really shine," Fenney said of her mount. The duo will be completing the final classes of the division Thursday, and hope to compete just as well in order to retain their position atop the pinnacle of the leader board. As if the first and the second places were not enough for the competitors out of Flower Mound, TX, MTM Farm had another horse in the running. Dorothy Douglas rode MTM Check Me Out to the third place finish in the first over fences class of the Pre-Green 3' Hunter division. Although Fenney and Douglas have put in strong performances to solidify some top spots on the judge's card, so too have a few other competitors who aim to knock them out of the top position when competition resumes tomorrow. Out of 34 entries, the large class produced a few other standout names. Maria Rasmussen and Maastricht, owned by Ashley Netzky, rode their way to the first and third, while Sarah Young navigated Emily Keena's Diamond Juliette to the first and fifth place finishes. Returning to the hunter ring to compete against 20 other entries in the Pre-Green classes at the slightly higher 3'3" height, Fenney paired with MTM Personalized, also owned by MTM Farm, and repeated her efforts, earning the same placings of first and second to kick off the division. The pair earned an impressive score of 86 that netted them the win in not only one of the division classes, but held as the top score in the $1,000 Pre-Green Hunter Challenge, as well. "It's been a great week for MTM Farm and our horses and riders," commented Fenney. "Between Dorothy's win in the Grand Prix last weekend and the stellar performances of our horses, we have a lot to be happy about." MTM Farm brought nearly 20 horses to the Spring Spectacular three-week series, with the riding responsibilities mainly shared between Fenney and Douglas. 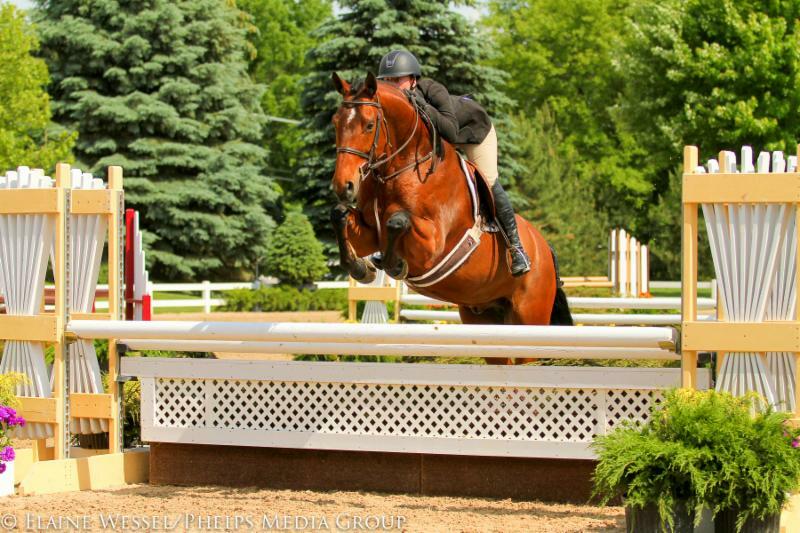 For many, the MTM name is synonymous with success in both the hunter and jumper rings, and the farm can boast an incredible number of wins in classes ranging from the 2'6" hunters all the way to major stakes classes and grand prix. Balletomane and Sarah Young, owned by Micaela Kennedy, were also strong contenders in both the 3'3" Pre-Green classes as well as the Pre-Green Hunter Challenge. The pair earned high placings of second and fourth behind Fenney in the 3'3"-division, and came in close second behind her with a score of 84.5 in the Pre-Green Hunter Challenge. The second portion of these divisions, as well as the professional hunter classes, will wrap up tomorrow, with the highlight of the day being the afternoon's $20,000 Welcome Stake, sponsored by Nutrena, in the Grand Prix Ring.